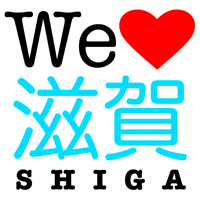 Here’s the fireworks (hanabi) schedule for Shiga Prefecture in summer 2013 listed by date. 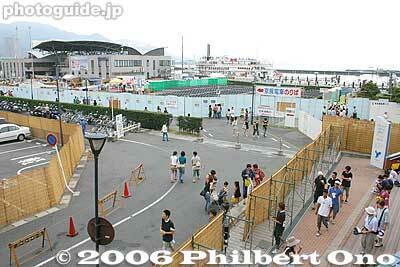 If you want to see the schedule for 2013 summer festivals (matsuri) instead, click here. Near the Inugami River Muchinbashi Bridge. 10-min. walk from Ohmi Railways Takamiya Station. If rained out, to be postponed to July 14. Along the Yasu River. 20-min. walk from JR Moriyama Station. If rained out, to be postponed to July 15. At two locations along the Echigawa River bank near Miyukibashi Bridge. 15-min. walk from Ohmi Railways Echigawa Station. If rained out, to be postponed to July 21. About 40,000 people are expected. 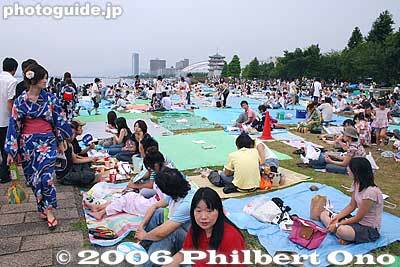 Watch the fireworks over the lake from the famous Omi-Maiko beach. Near JR Omi-Maiko Station (Kosei Line) in western Otsu. If rained out, to be postponed to July 28. Fireworks is the climax of this summer festival (bon dance, etc.) held in the northern parking lot of Hino Town Hall. Part of an illumination andmusic festival. 20-min. by bus from Yokaichi Station. If rained out, to be postponed to Aug. 6. Includes bon dancing. At Kitanoshosawa area. Shuttle buses provided from Omi-Hachiman Station. 10-min. walk from Nagahama Station. Very crowded so go early to save a spot or pay for special seating. If rained out, to be postponed to Aug. 6. Hama-Otsu on Biwako fireworks day. Tall walls block your view. Fireworks along the Seta River near Ishiyama-dera temple. 10-min. walk from Ishiyama-dera Station on the Keihan Line. 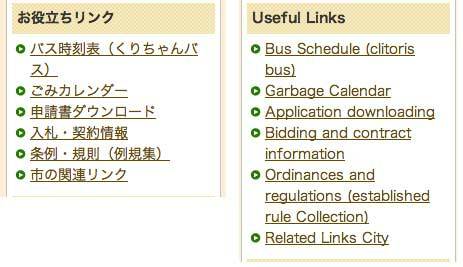 Also see the schedule for 2013 summer festivals (matsuri). 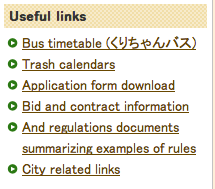 栗東市役所ホームページの機械翻訳結果の一部。 A bad idea to officially use machine translation on local government Web sites. Went to see sumo on January 25, 2013, the 13th day of the New Year’s sumo tournament at the Kokugikan sumo arena in Tokyo. I finally saw Nionoumi (鳰の湖), Shiga’s only sekitori (a sumo wrestler in the second-highest Juryo or highest Makunouchi/Makuuchi Division). He was ranked West Juryo No. 14. It’s been two years since Nionoumi (pronounced Nio-no-umi) first made it to the Juryo Division. He has since been going down and up in the ranks. At this month’s New Year’s tournament in Tokyo, he ended with a decent 8 wins and 7 losses. Since he was already ranked at the bottom of the Juryo Division, it looks like he will retain his rank or be slightly promoted in Juryo for the next tourney in March in Osaka. This is good news. The difference between Juryo and the lower Makushita Division is huge. There used to always be a Shiga sumo wrestler in the top Makunouchi Division, but not anymore. At least we got one in Juryo who will hopefully get back up to Makunouchi. Born in 1986 as Shinji Tanaka (田中 真二), Nionoumi is from Otsu and a graduate of Ojiyama Junior High School. He practiced judo as a child and became quite formidable, becoming one of the top 16 junior high school finalists in a national judo tournament. After graduating from junior high school, he entered Kitanoumi Stable run by former Yokozuna Kitanoumi (one of the greatest yokozuna ever) and current chairman of the Japan Sumo Association. Nionoumi made his sumo debut in March 2002. At 175 cm and 148 kg, he’s kind of small for a sumo wrestler and looks somewhat stocky. His ring name “Nionoumi” means, “Lake of Little Grebes.” This is Lake Biwa’s nickname which stems from the lake’s numerous water fowl including the Little Grebe which is Shiga’s official bird. I think it’s a great ring name. It also retains part of his stablemaster’s ring name of Kitanoumi (Lake of the North 北の湖) which refers to scenic Lake Toya in Hokkaido where Kitanoumi grew up and has his Yokozuna Kitanoumi Memorial Hall museum. Nionoumi was first promoted to Juryo in Jan. 2011. But his Juryo debut ended disastrously with 5 wins and 10 losses and he was demoted back to Makushita. After two tourneys in Makushita, he climbed back up to Juryo in Sept. 2011. In Jan. 2012, he even made it to the top Makunouchi/Makuuchi Division as Maegashira No. 16. Unfortunately, his Makunouchi debut ended terribly with 5 wins and 10 losses which demoted him back to Juryo. He has since been struggling in Juryo. Let’s hope that he will keep winning in 2013. 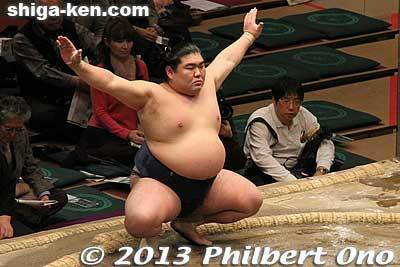 Meanwhile, we have three other sumo wrestlers from Shiga in the lower sumo divisions. In Sandanme, there’s Koryuyama (b. 1979 甲龍山) from Koka and Naniwaryu (b. 1982 浪花竜) from Otsu. And in Jonidan, Tomonofuji (b. 1977 智ノ富士) from Ritto. Although they are already in their 30s (which is quite old for a sumo wrestler), good luck to them as well. Koryuyama (right) is quickly defeated by Tamanotaka (left) on Jan. 25, 2013, the tournament’s 13th day. Naniwaryu (right) is pushed out by Nishiyama on Jan. 25, 2013, the tournament’s 13th day. Although Nionomumi did well up to May 2013, he did poorly in July (1-14) and got demoted to Makushita. As of Nov. 2013, he was ranked West Makushita No. 5.